In a little over a week’s time my hubby & boys will set off from our home on Dartmoor to cycle through France, hopefully arriving safe and well after about 18 days in Sete. They’ll be cycling just over 1500km in that time, not quite the Tour de France, but a big ride whichever way you look at it. 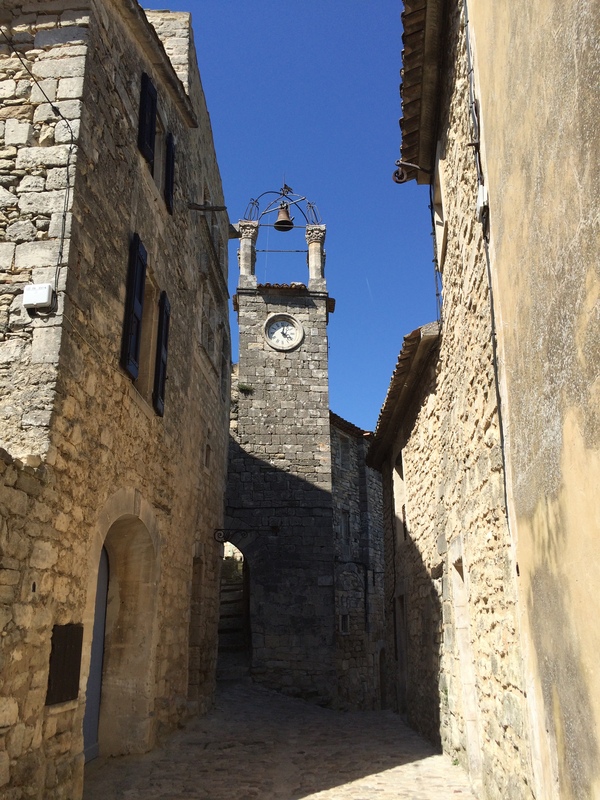 In the meantime I’m pottering around the quiet lanes of the Vaucluse on my own bike ‘Miss Daisy’. 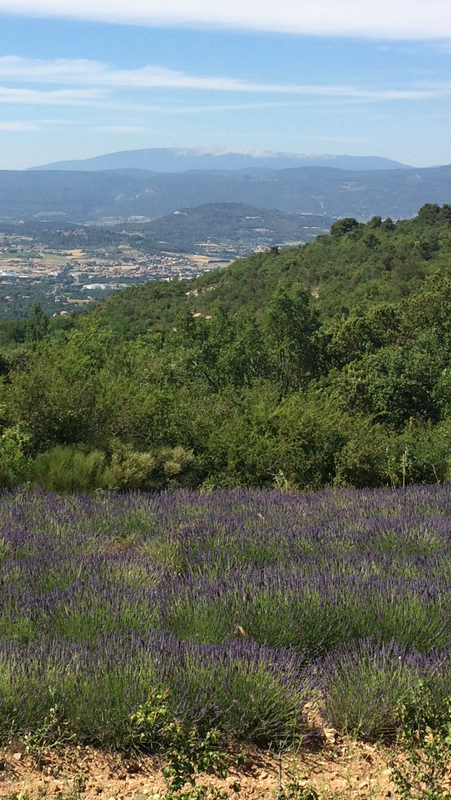 I can’t imagine I’ll come near to doing 1500km, but am having a wonderful time riding new routes that all start from the off-road cycle route ‘Veloroute du Calavon’, which runs through the Luberon valley. ‘Miss Daisy’ taking a well-deserved rest ! 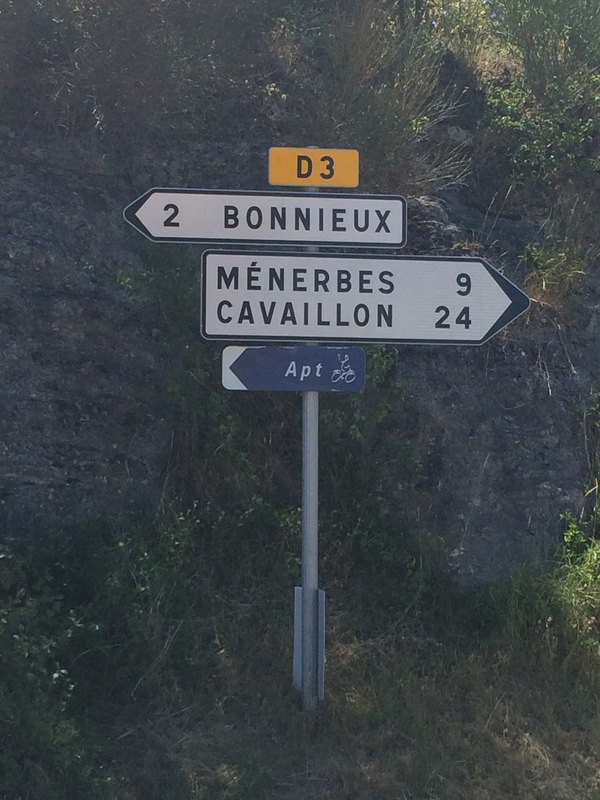 This ride, which is quickly becoming a favourite of mine, takes in Lacoste & Bonnieux, 2 of the pretty hill villages that sit on the flank of the Petit-Luberon and also Saignon with its commanding position on the rocks above Apt. 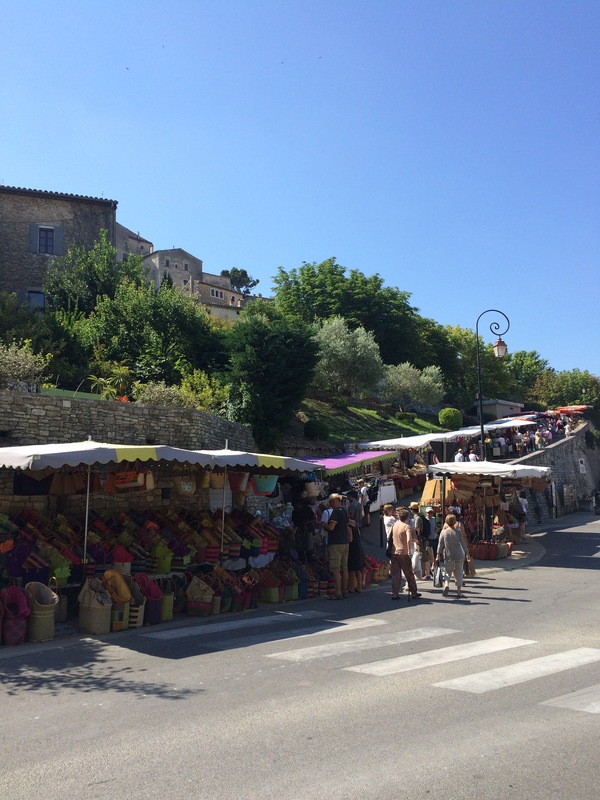 A great day to do the ride is a Friday, when Bonnieux is buzzing with the local market that spills out of the main square to the terrace around the church, although to be honest any day is good! ……. 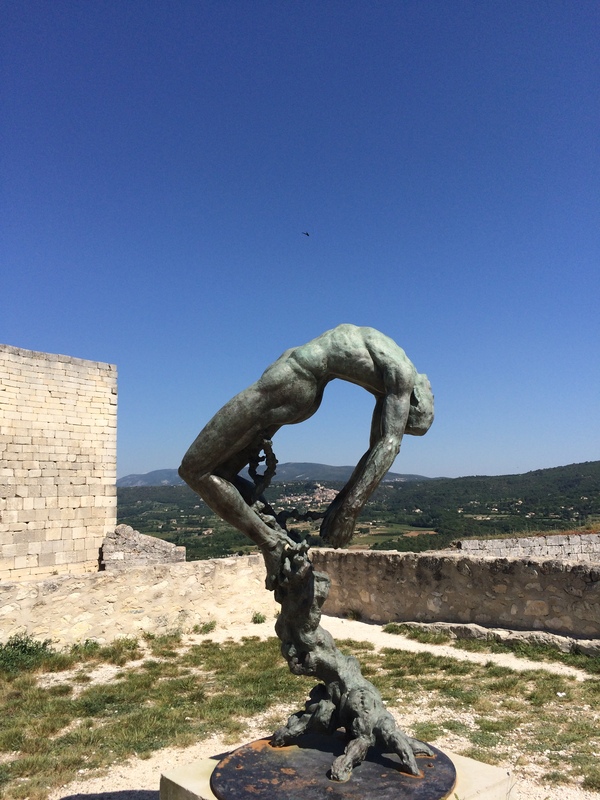 before taking a right turn and starting to climb towards Lacoste, on a road that winds gently upwards through vineyards & cherry trees with fantastic views across the valley & beyond towards Mont Ventoux. The views from the terrace outside the Chateau are incredible and it is certainly worth the additional effort needed to get up to it. Of course if you don’t fancy the trip up you can always simply sit & take a break with a cooling drink on the terrace of the ‘Café de France’, which not only has great views, but also was one of the locations used in the film ‘A Good Year’, although I’m still waiting to see Russell Crowe there ( hey ho). By the time I get here I’m about ready for lunch & there is a good selection of places to eat, from the Boulangerie below the market square to some really nice restaurants, although I tend to head to the Brasserie Les Terrasses, which has a terrace overlooking the view & does a rather nice oven baked Banon cheese salad, which arrives still in its wrapping of Chestnut leaves. A parcel of gooey Banon Cheese – just delicious! 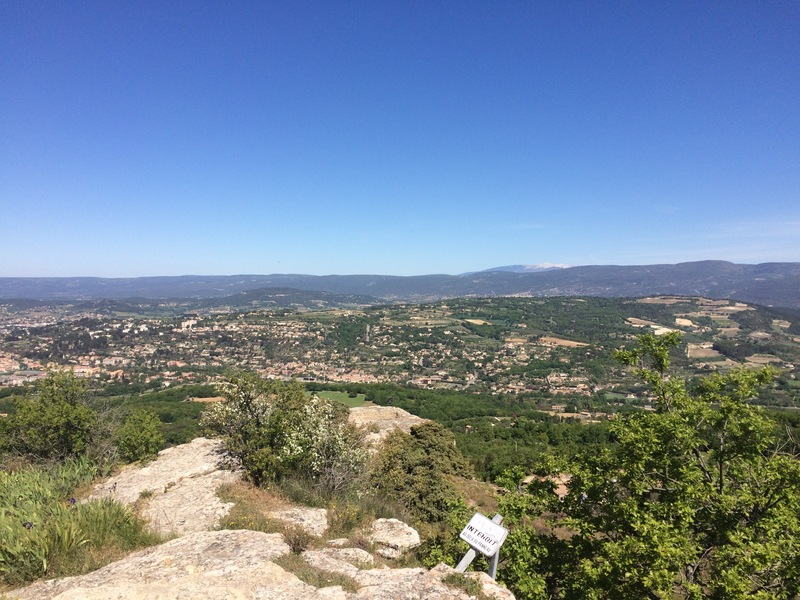 From Bonnieux you continue to climb towards the Foret Des Cedres, before taking a left turn signposted to Saignon, finally reaching the Col Du Pointu (499m), before turning onto the road that runs on top of the Plateau ‘Les Claparèdes, which runs towards Saignon. 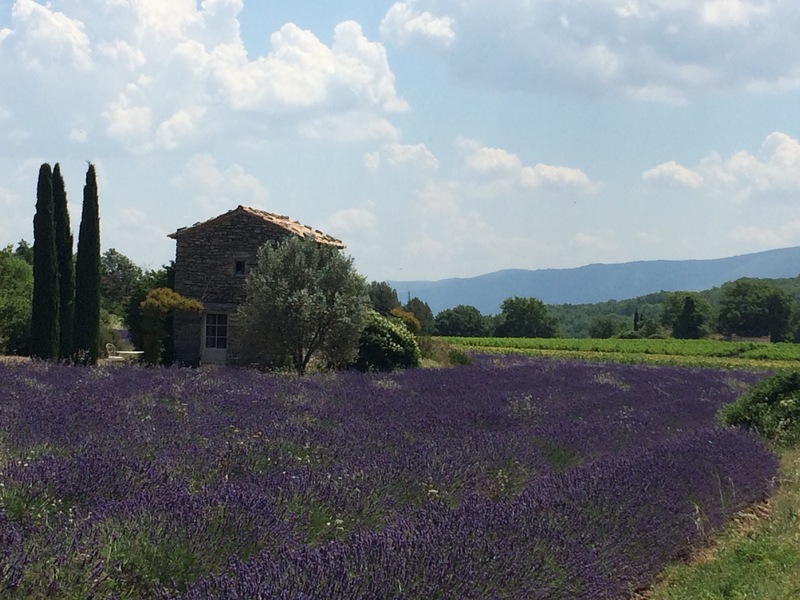 At the moment the lavender is in bloom & this lovely road runs alongside (and through)numerous lavender fields that are buzzing with insects & which fill the air with scent. It really is a lovely part of the cycle & every time I do it I just have to pull over & sit for a while just to really take in the sight, as I know it wont be long before the purple flowers are harvested & taken to the nearby distilleries. 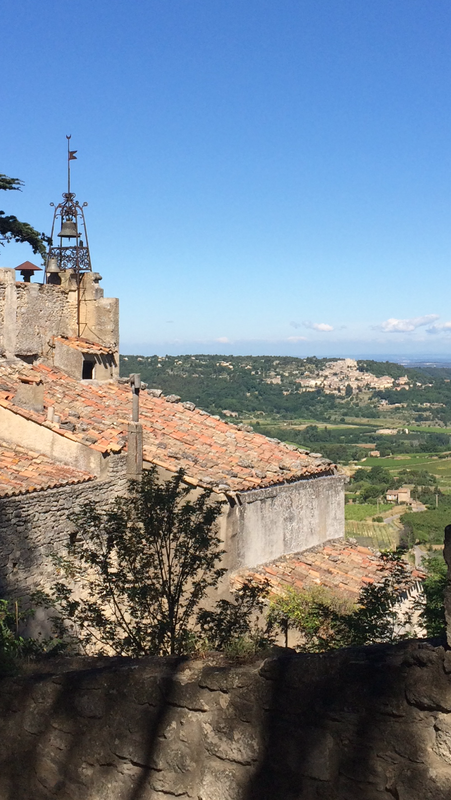 Eventually the road drops down into Saignon, which has vast open views down the Luberon Valley & it’s worth taking a walk up to the rocks at the top of the village to sit amongst the swifts and swallows as they glide out over the edge. …….together with a couple of other galleries and a nice range of places to eat places to eat. 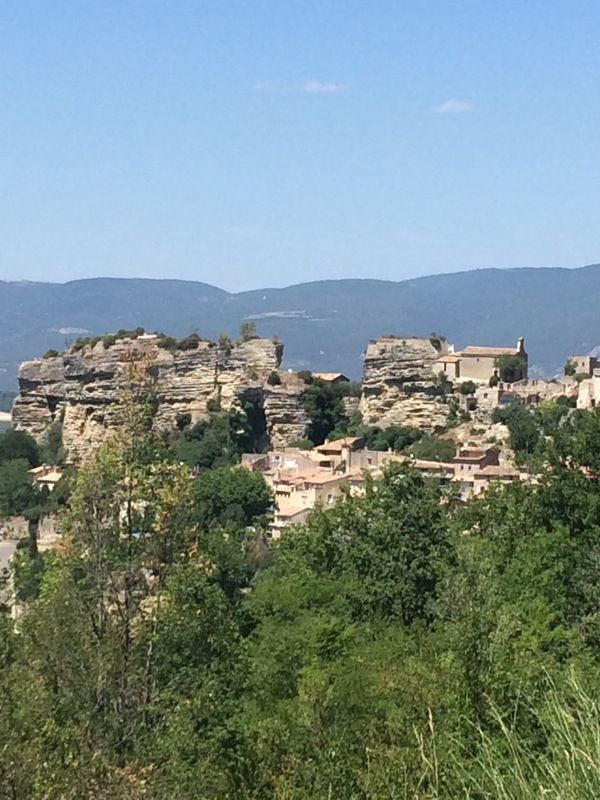 After wandering around Saignon I tend not to follow the road that leads straight back to Apt, but take the minor road that runs directly under the cliffs, which snakes down through lavender……. 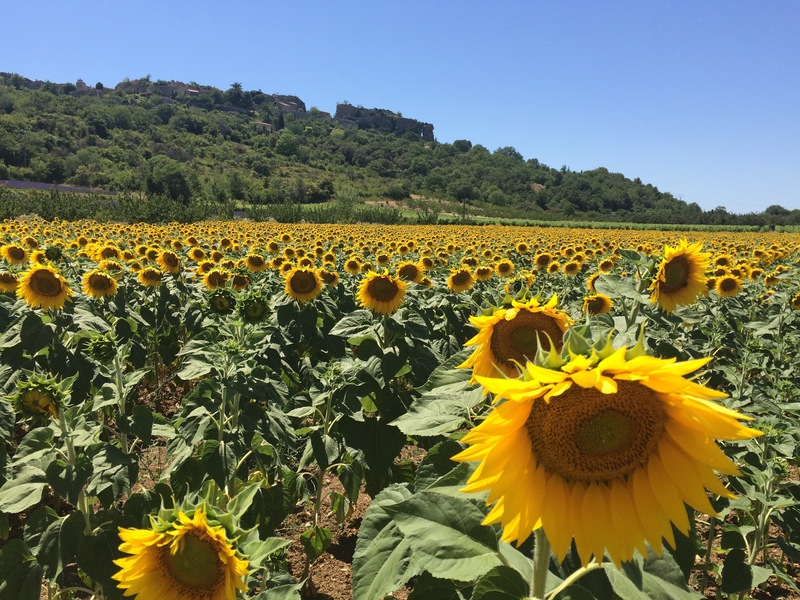 …….. & sunflower fields joining the Veloroute again at the junction with the road to Viens. From here you can easily get back to your starting point. The more I do this ride, the more I like it. The roads aren’t busy, particularly the route along the top of the Plateau and the views are stunning. 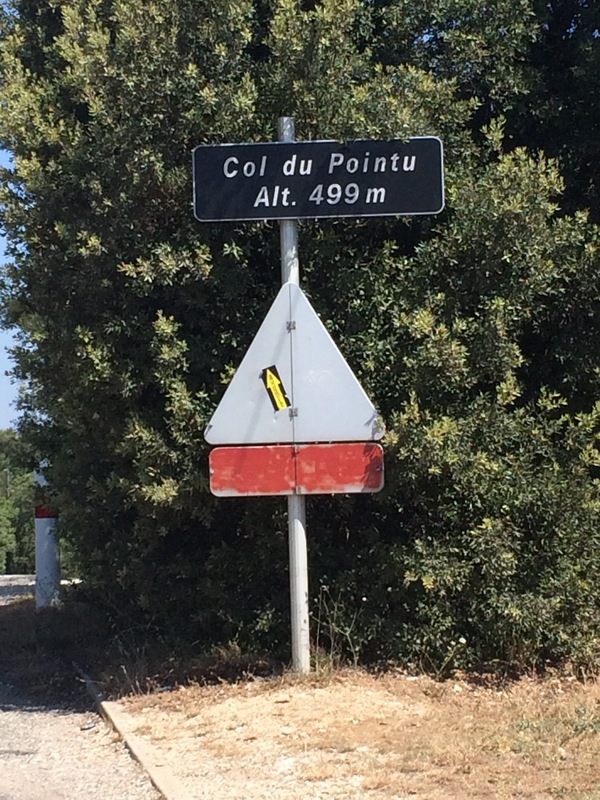 The constant sight though of Mont Ventoux always niggles at me & however much I try to ignore it – I know it wont be long till I head back over to ride it again! 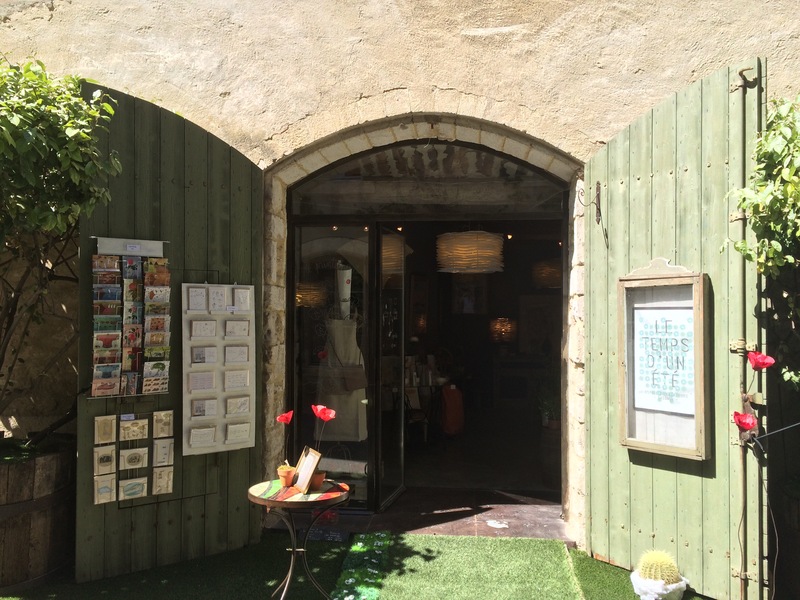 Previous Post A 3 day taster trip to the Vaucluse – where do I start? I can not imagine how stunning it must be there right now! I have never visited in July. I seriously just stared at your photos trying to imagine myself there. What a dream! I have seen the lavender at least in June but never so vivid or with sunflowers. I am dying to see that! 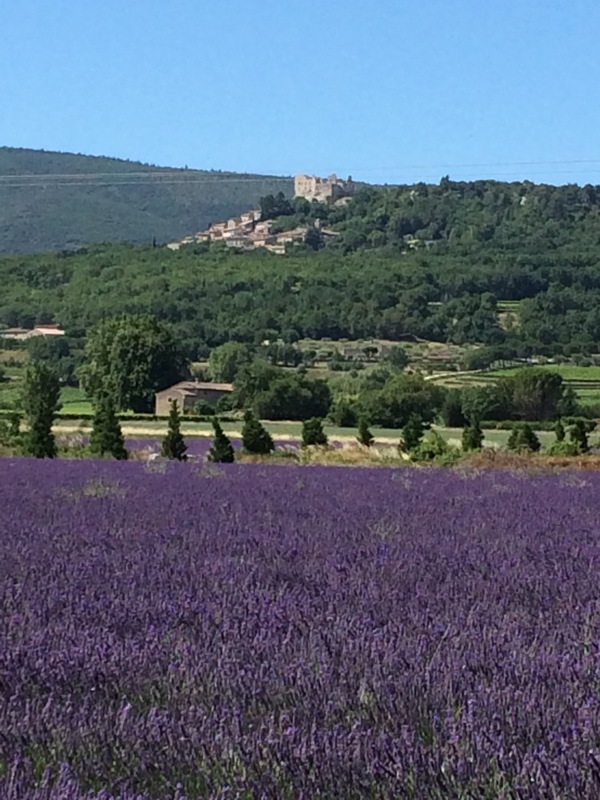 Thanks – I must admit we’ve been coming for nearly 30 years, but it almost feels as if I’m seeing it all for the first time – it is so stunning it’s really hard to put into words – today I cycled through fields of Sage too – that was yet another attack on my senses ! 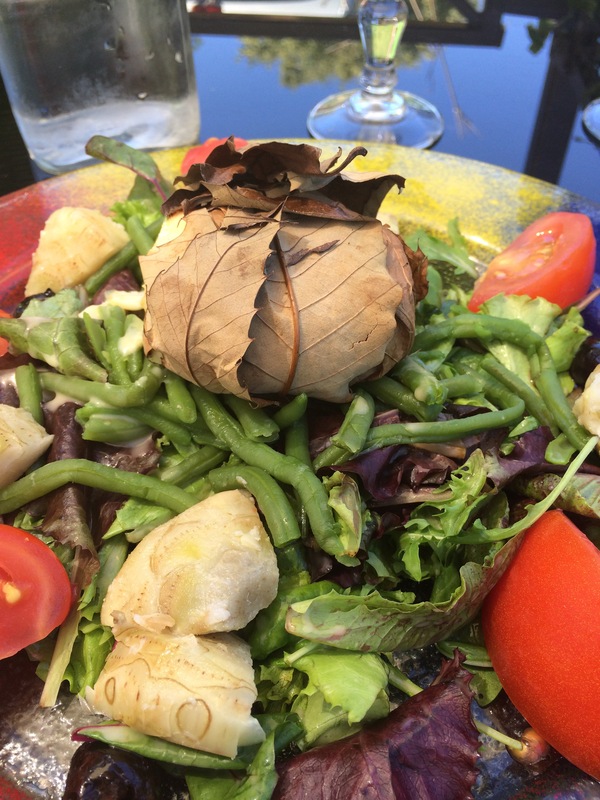 Julie – you have certainly covered the highlights of the Luberon at this time of year. Great pictures! All I can say is that I am very… no, make that extremely jealous. 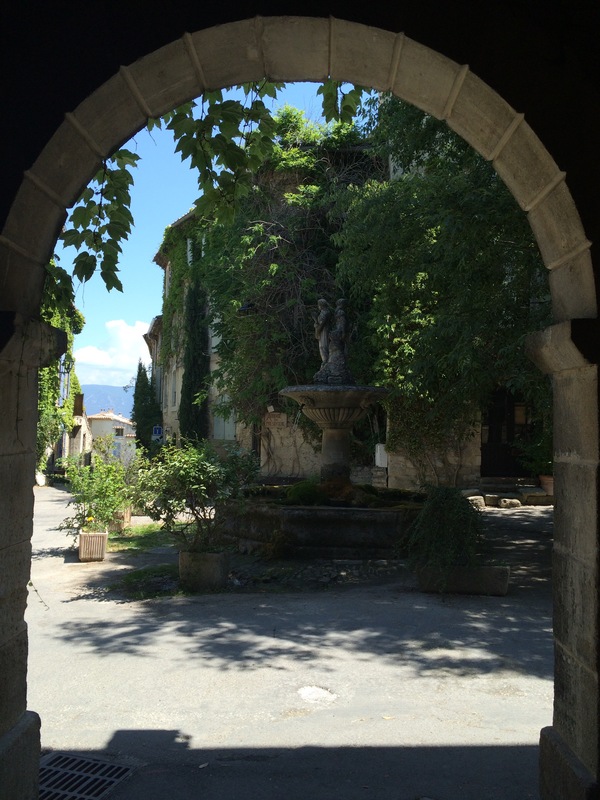 Your images remind me so much why we love this part of France. Hell, we just love France! I’m pleased you like them – you can’t help but want to take photos here – my poor phone is almost overwhelmed with them ….and this part of France is just wonderful I agree! 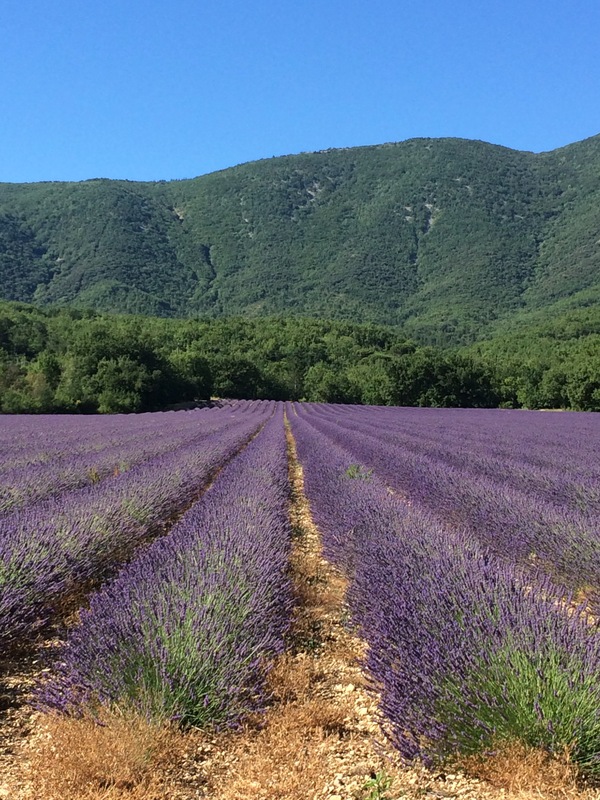 Thanks – The lavender fields are incredible& there are so many of them, particularly across this plateau & on the other higher pieces of land. Needless to say my phone doesn’t know if it’s coming or going with the photos I take! The cycle path is such an asset to the valley – we remember what it was like just to have the busy main road to get anywhere quickly & it wasn’t the nicest of experiences! Thanks & I’m pleased you like the photos, my poor phone spends so much time in & out of the basket! 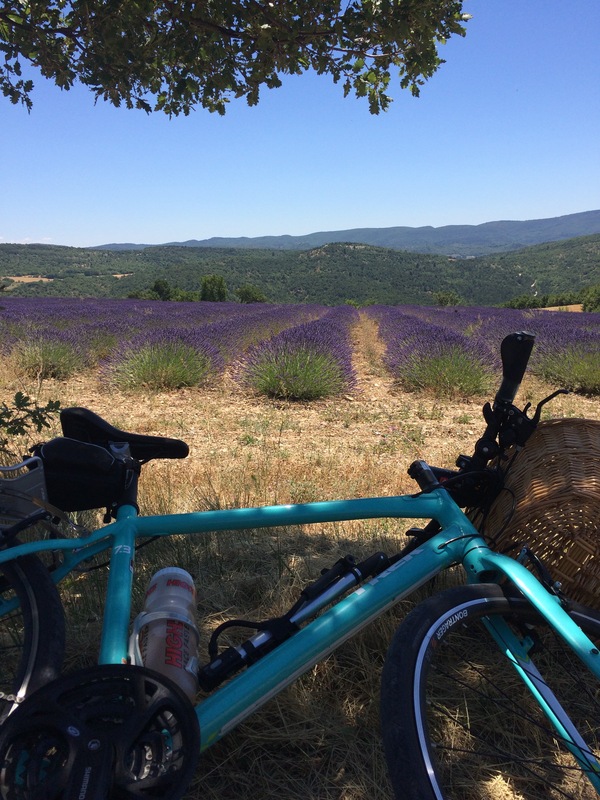 The area is great for cycling & my view is that you don’t have to ride as if you’re on the Tour de France – it doesn’t matter if you stop several times (as I normally do) – the main thing is just being able to really experience the area, smells, colours & all! Of course ( and never let my boys hear me say this!) you can always use an electric bike to give that bit of extra umpfh! Thanks for the good luck wishes too – their final training ride was today & on Friday it all starts for real & I’m just looking forward to seeing them all again, Skype is good, but no substitute for the real thing ! Oh my goodness, this is so insanely beautiful! 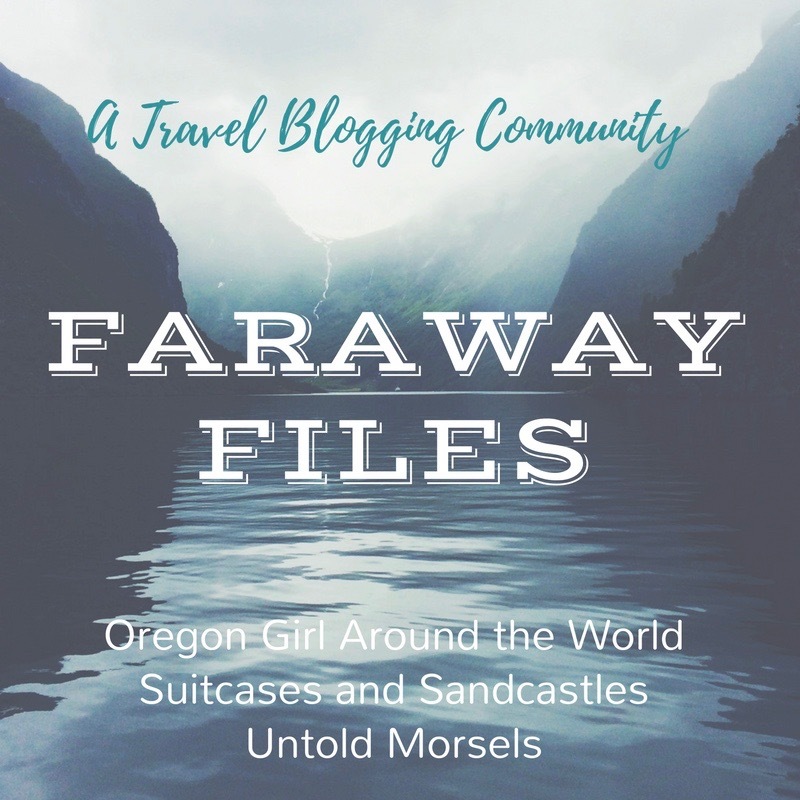 Love going on your cycling trips with you via the blog! I miss France SO MUCH!!! Thanks, so pleased you’re enjoying them! I love cycling around here so much & it’s such a great way to see the area & you experience so much more than just going from A to B by car. I’ve got more rides to write up yet & they just get better! Such a fabulous time to be out and about on your bike, with the lavender and sunflowers in bloom. I’m pretty jealous. I’m commenting so late for #AllAboutFrance because the last 2 weeks have been the busiest of my working year and I’ve been inside the whole time! I’d love to head over your way and see the lavender again, I haven’t been for a few years. Is it still out? I guess your family must have started their cycle trip, I hope it’s going well. Thanks for linking up again. Thanks & so pleased you enjoyed it – the lavender is just so stunning & certainly worth making the trip to come & see it! The harvest is just starting so sadly the fields are losing the colour, but it smells fantastic ! 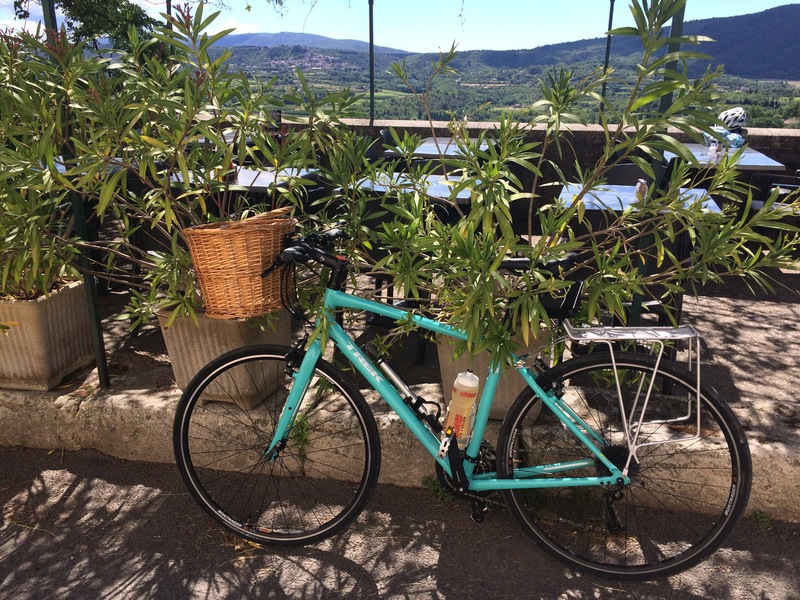 Thanks – cycling there is just the perfect way to see the area & the days quickly slip by – it also means I never feel guilty about a trip to the patisserie! Thanks – I’m pleased you like them – Miss Daisy is the first bike I’ve given a name to, but she just suits it so well!